So let your creative side get working on the right combination for you! From hood stripes and mirror covers to gear shift knobs and roof racks – MINI of Ann Arbor has everything you need to make a statement. Our parts manager, Greg Bryant, has 17 years of parts management experience, and absolutely LOVES helping fellow MINIacs customize their ride. So browse through some of our most popular accessories below and if you can’t seem to find exactly what your looking for – give us a call. Or better yet – come on down to MINI of Ann Arbor and talk with us in person. The advice is free, your visit is appreciated, and who knows – you just might leave in the perfect expression of you! 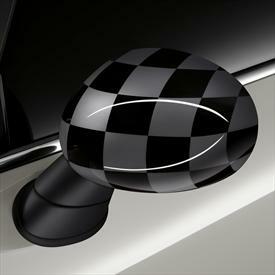 Checkered Flag mirror caps and side scuttles are the perfect way to let the world know that you don’t intend to come in second. An easy DIY Project that will have all eyes on you. 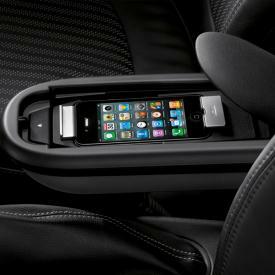 This snap-in adapter will cradle your Apple iPhone safely out of sight in your center armrest while you access your music and phone calls via Bluetooth, all the while keeping your phone charged and your cabin “cable-free”. 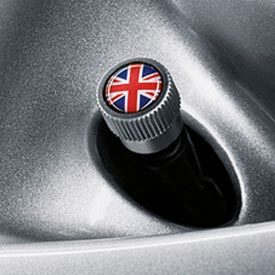 The Union Jack incorporates the national symbols of England, Scotland, and Northern Ireland – the very nature of a “United Kingdom” – three diverse nations (or four tire valves) unified under one flag. 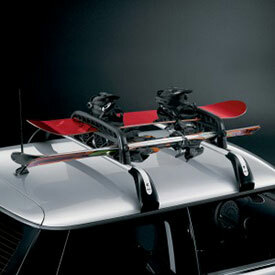 Holding up to 6 sets of skis and poles OR 2 sets of skis and one snowboard, the Ski & Snowboard Rack makes your MINI the perfect shuttle to your favorite ski destination this winter. Nothing makes your car look faster that a set of bonnet stripes. 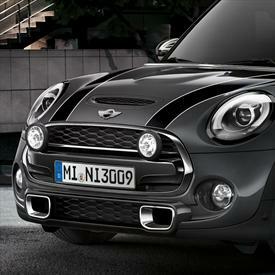 Black, White, Silver and more – bonnet stripes add at least 12.5 visual horsepower to any MINI. 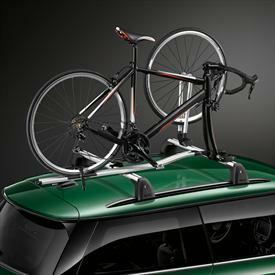 Keep your bike safe and secure (and easy to reach) on the back of your MINI with this lockable bike rack. **Also requires the installation of the rear rack base support system. All Work is carried out by MINI trained Technicians using MINI Original Parts, which comes with two-year unlimited mileage limited warranty. Warranty repairs do not constitute an extension of the original limited warranty period of the vehicle or a part thereof. Services and oil services covered under a MINI Maintenance Program are not eligible. PURCHASE: Any of the 3 services outlined above at a participating MINI dealer between 3/10/19 and 4/30/19. CLAIM: Go to miniaftersalesoffer.com, sigh up and complete the online Claim Form. All submissions must include the VIN, MINI Dealer name, Repair Order Number and Rebate requested. Submit all Claims by 5/15/19. RECEIVE YOUR REBATE: Once your Claim is validated, within approximately 2-3 weeks, you will be sent an email to register for your Virtual Visa® Prepaid Card, if requested, within 4-6 week of your request. VALIDITY OF OFFER: Offer is valid only in the U.S. and Puerto Rico. Offer is void where taxed, restricted or prohibited by law. Offer is valid only for persons who have a valid email address and purchase the eligible MINI services in accord with the term herein. Eligible for MINI vehicle owner or end user only. Valid at participating dealers only. TERMS AND CONDITIONS: Submit online rebate claim form for all submissions. Incomplete submissions will not be accepted or fulfilled. Non-eligible submissions will not be acknowledged. All rebates will be issued in U.S. dollars. We are not responsible for lost or misdirected mail and illegible entries. The Visa® Prepaid Card is not redeemable for cash and may not be used for cash withdrawal at any cash-dispensing location. Each time you use the card the amount of the transaction will be deducted from the amount of your available balance. Use your Virtual Visa® Prepaid Card online or via mobile only. Physical Visa® Prepaid Cards can be used anywhere Visa® debit cards are accepted in the U.S. valid only in the U.S. and U.S. territories. Visit miniaftersalesoffer.com to view full terms and conditions governing these terms and conditions. Card is issued by the Bancorp Bank, pursuant to a license from Visa U.S.A. INC. Pay close attention to the expiration date, which is six (6) months from activation. You will not have access to funds after the expiration date. Receive $75 back via rebate with the purchase of any brake service. All Work is carried out by MINI trained Technicians using MINI Original Parts, which comes with two-year unlimited mileage limited warranty. Warranty repairs do not constitute an extension of the original limited warranty period of the vehicle or a part thereof. Services and oil services covered under a MINI Maintenance Program are not eligible. PURCHASE: Any of the 3 services outlined above at a participating MINI dealer between 3/10/19 and 4/30/19. CLAIM: Go to miniaftersalesoffer.com, sigh up and complete the online Claim Form. All submissions must include the VIN, MINI Dealer name, Repair Order Number and Rebate requested. Submit all Claims by 5/15/19. RECEIVE YOUR REBATE: Once your Claim is validated, within approximately 2-3 weeks, you will be sent an email to register for your Virtual Visa® Prepaid Card, if requested, within 4-6 week of your request. VALIDITY OF OFFER: Offer is valid only in the U.S. and Puerto Rico. Offer is void where taxed, restricted or prohibited by law. Offer is valid only for persons who have a valid email address and purchase the eligible MINI services in accord with the term herein. Eligible for MINI vehicle owner or end user only. Valid at participating dealers only. TERMS AND CONDITIONS: Submit online rebate claim form for all submissions. Incomplete submissions will not be accepted or fulfilled. Non-eligible submissions will not be acknowledged. All rebates will be issued in U.S. dollars. We are not responsible for lost or misdirected mail and illegible entries. The Visa® Prepaid Card is not redeemable for cash and may not be used for cash withdrawal at any cash-dispensing location. Each time you use the card the amount of the transaction will be deducted from the amount of your available balance. Use your Virtual Visa® Prepaid Card online or via mobile only. Physical Visa® Prepaid Cards can be used anywhere Visa® debit cards are accepted in the U.S. valid only in the U.S. and U.S. territories. Visit miniaftersalesoffer.com to view full terms and conditions governing these terms and conditions. Card is issued by the Bancorp Bank, pursuant to a license from Visa U.S.A. INC. Pay close attention to the expiration date, which is six (6) months from activation. You will not have access to funds after the expiration date. Brake Service must include replacement of front or rear pads and/or rotors. Receive $25 back via rebate with purchase of a MINI Original Battery. Receive $25 back via rebate when you purchase a MINI Original Wiper Blade Set in combination with service visit of $250 or more.